After breakfast drive to Jaipur. On arrival check-in at hotel. Afternoon proceed for a city tour visiting the unique stone observatory Jantar Mantar, the opulent City Palace with its museums, the Hawa Mahal Birla Temple and city etc. Overnight in Jaipur. Breakfast at hotel. After breakfast visit Amer Fort, which is located 12 km. outside Jaipur. One of the finest example of Rajput architecture, it was the ancient capital of Kaisshawah rulers. Enjoy the ascent to the Palace on the back of a brightly caparisoned elephant. Visit the multiple chambers and hallways of the palace which are famous for their design and decorations. After sightseeing drive further to reach Agra en-route visiting Fatehpur Sikri, the deserted 16th century red 0sandstone city built by Emperor Akbar. Here you visit the Bulund Darwaza (The Gate of Victory) - the tallest gateway in the world, and the superb white marble tomb of the famous Sufi saint Shaik Salim Chishti. Continue your drive to Jaipur. Built by Raja Jai Singh in the 18th century, Jaipur, the capital of Rajasthan is a picturesque city in a symphony of pink. Upon arrival and check in hotel. Overnight Agra Hotel. Early Morning Sunrise Time (0500 hrs.) visit - TAJ MAHAL (closed on Fridays), an extravagant marble monument of love, built by Shah Jahan in 1653 as a memorial to his queen Mumtaz Mahal. One of the Seven Wonders of the World, this beautiful mausoleum in pure white marble took 22 years and 22,000 craftsmen to build. Back to hotel for breakfast etc. After breakfast Continue your tour to the Agra Fort, an original red sandstone fort built by Mughal Emperor Akbar in 1565. The forts maze of courtyards, its marble mosque and lavish private chambers reflect the grandeur of the Mughal Empire and city sightseeing. Afternoon drive to back to Delhi. Free at leisure. Overnight in Delhi. Early morning in time departure transfer to New Delhi Railway Station to catch Shatabdi Express Train No. 12029 at: 0720 hrs. Breakfast on board. Arrive Amritsar Railway station at:1325 hrs. On arrival meet and assist and transfer to hotel for check-in. Afternoon visit – Wagha Border to See world famous flag ceremony - Situated in between Lahore and Amritsar, evenings in this army outpost is very charming and colorful with the "Beating the Retreat" ceremony. The pageantry and pomp, and the change of guard within a short expanse make an appealing spectacle, which grabs large gathering. The most important segment of the ceremonial parade is the bringing down of the respective flags of both countries. Tourists and the locals throng near the border to witness the ceremonial parade of the Soldiers of the two countries. When the sun sets in the horizon, the soldiers take their departure amidst the beatings of the drums and beguiles. The entire ceremony nearly takes thirty minutes. 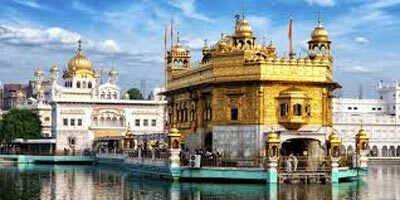 Drive back to Amritsar and visit Golden Temple. Overnight Amritsar Hotel. Breakfast at hotel. 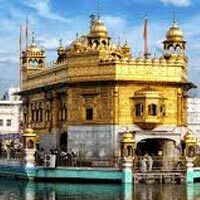 After breakfast visit - Golden Temple + Jallionwala Bagh + Durgina Temple and city. Free till departure. In time departure transfer to Railway station to catch Swarna Shatabdi Express Train no. 12030 at: 1655 hrs. Dinner on board. Arrive New Delhi Railway station at: 23:05 hrs. On arrival pick and transfer to hotel. Overnight in Delhi. Breakfast at hotel. Free till departure. In time departure transfer to International Airport to catch flight for onward destination.